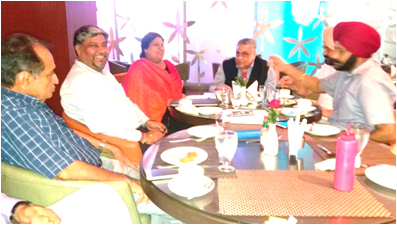 Mr. Sanjay Grover, Director-AIMA, paid his official visit to Chandigarh Management Association on 26th August 2016 at Hotel Shivalik View, which was attended by the Executive Committee members. The report on the events organized by CMA was presented before Director-AIMA, which was appreciated by him. He provided inputs to increase the visibility and quality of programmes and also shared the upcoming events of AIMA for enthusiastic participation of CMA. It was indeed a learning experience.